note: this list is not my own, they are according to Amazon’s best sellers of all time. Who here can disagree that personal finance is one of the most important skills you can possibly learn? It’s sad that most people are naturally born with this trait and we know most schools don’t teach this subject. Like everything in life, you can possibly beat the curve ball with someone to guide you and teach you about the value of holding onto your money, using it to make even more money. Sometimes your parents are these people, sometimes it is a mentor you have to pay for, or sometimes it comes through in the form of literacy. With the rise of e-publishing, any one can self publish a book now a days. So try to stick with these best-selling books by true financial experts. This is a great book that allows the reader to explore their childhood experiences and figure out if these memories are sabotaging their chance of being wealthy. It strives to get to the bottom of understanding everyone’s “money blueprint” that is embedded in their heads. This book offers great tips on how to retire early, how to do so without a million dollars in the bank, and how to keep yourself busy and happy each day. Simply one of the best personal finance books out there, and I would argue one of the best books ever written. You can take these principles that are outlined in this book and apply them to so many other facets in your life. This book, really hits home as of late, especially where this blog is concerned. Schwartz’s idea is that people succeed only if they are optimistic, believe in themselves, find something positive in even the worst failure, and assume they’re going to win. The book I am currently re-reading. Does me succeeding even matter, if my kids live the same kind of life I did? This book is a reminder that nobody is born knowing how to use money properly. I have to admit, I never read this book. But if it is in Amazon’s Top Ten Best Selling Personal Finance Books… I am sure to look into it. In the book Edelman works to make financing one’s retirement as uncomplicated as possible. Another book I never read. Supposedly his reputation for being loud and boisterous is an act, and that this book has a lot of wisdom in it. This is one of the books that really left an impact on me after reading it. The book’s thesis: every little decision you make in life, even ones that don’t seem like anything, has a compound effect on every other part of your life. One of the funnest and easiest to read books that will escalate your financial knowledge tenfold. He tells the story of two fathers: his own (highly educated, never made a lot of money) and his friend’s (dropout that is now a millionaire). One simple rule Dave Ramsey lives by… don’t borrow money, pay with cash every time. Here’s my debt update now that March is over. First, I removed my student loans from the spreadsheet. I shared them in the first debt update to give you a big picture of all my debts. I’m not opposed to sharing them with you and am happy to do a big quarterly update if people are interested, but I always said my focus was on credit cards and I’m paying so little toward the student loans that I’d rather look at this reduced spreadsheet so you can really see where I’m making dents in my debts instead of just having a HUGE looming debt amount that barely budges every month (which would be the case if student loans were included). Second, the medical bill debt is no longer approximate – this is the actual amount owed. Just so you know, the total amount was actually over $9,000 but we had already been making some payments, and when we had extra money last month we put a big chunk of it directly toward a lot of the smaller medical bills we had received (more details this afternoon when I discuss our revised budget). 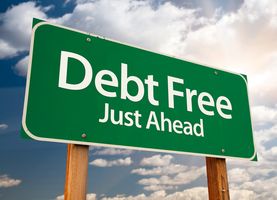 Some may argue this was unwise since they were interest-free, but we had 8 different medical entities to pay and now we have reduced this number down to 4 and have established payment plans for the remaining debt (except the Mayo Clinic – details this afternoon). It was important to me to knock out a lot of the smaller bills so we could have fewer monthly debts to deal with. Third, in regard to the license fees, many people commented on my last post to look into the “service” fee, saying it might be more than I think. I checked it out and discovered that the service charge is a percentage of the payment received. I played with the numbers and for a payment of $50 it was $1.38 (2.7%); for $75 it was $1.74 (2.3%); for $100 it was $2.50 (2.5%), so it appears the percentage of the fee goes down with larger payments. Regardless, 2.7% is still much lower than any of my credit card debt so I will continue making smaller payments to that entity at this time. I also plan on drastically increasing the amount we pay toward debt, overall, each month. I feel like this is a tease, but I’ve got to tell you just to make sure you check back this afternoon for our full revised budget where all these details will be revealed.